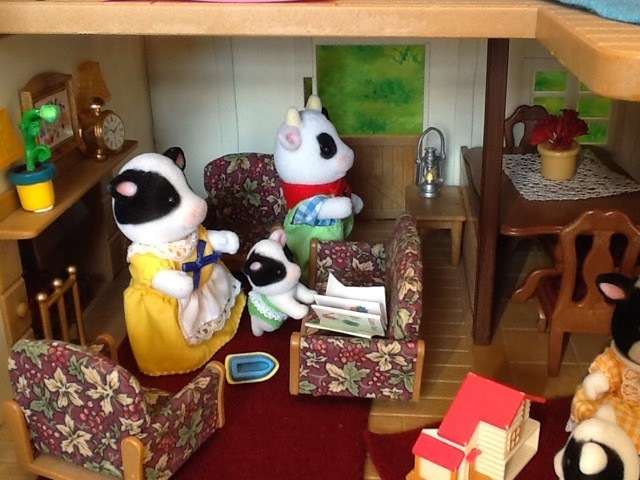 As some of you might know I received my much anticipated and most coveted Sylvanian Families house, Highfields Farmhouse, last week. I couldn't wait to arrange the furniture that I've been collecting for the Buttercups in it and just play with it. I got the story idea from Sigrun. I love the house. 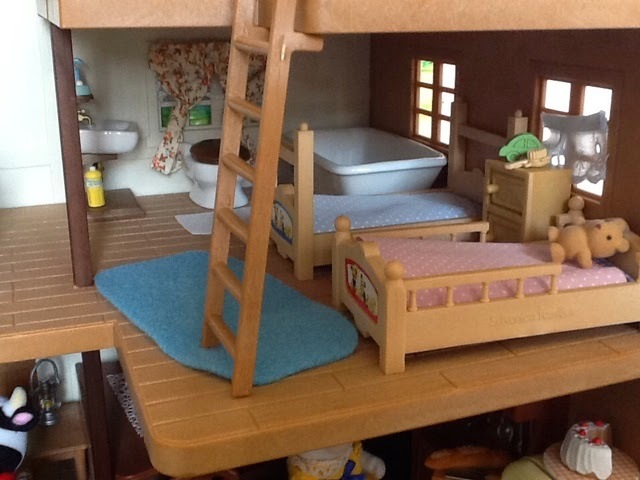 It is so big and finally a Sylvanian Families house where I don't need to cramp everything into a small room. Enjoy the story and keep posted for some regular updates! Daisy Buttercup takes the loaf of bread that she baked for dinner out of the oven and places it on the bread plank. When she turns around to close the oven door her eye catches the curtainless windows and the bare walls. 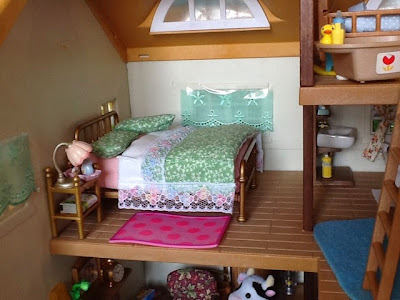 Oh how she would love to decorate and refurbish her house a bit. Her mind drifts to the upstairs rooms. White walls with curtains that are barely covering the windows. In the bathroom she would love some modern tiles and not to mention matching curtains. And she would love wall to wall carpeting especially in the bedrooms. Daisy immediately felt ashamed, it wasn't as if she was ungrateful. She loved her house. It was comfortable, somewhat cosy and most of all huge. 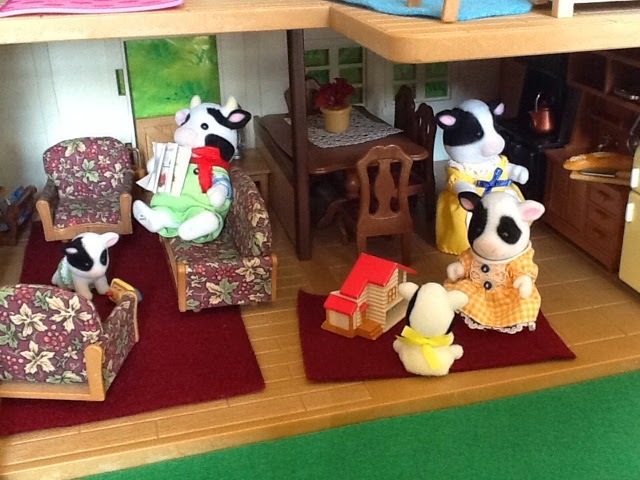 Especially compared to the houses of her friends who lived in the village. She slowly walked over to the couch where Hornbull was sitting or rather sleeping. Hornbull (sitting bolt upright, he was almost asleep): Yes Daisy? Daisy: I've been thinking... uhm... I feel like redecorating our house. Hornbull (grunting): But why? Our house is perfect. Daisy: Seriously, is that what you think? Hornbull: Yes, but I guess you don't agree with me? Daisy: Hornbull, look around. The walls looks so bare, and some windows don't even have curtains. Hornbull: At least we have great furniture. Daisy (throwing her hands up in the air): What is the point of having fantastic furniture if the decorations are so dreary! Walk with me Hornbull! 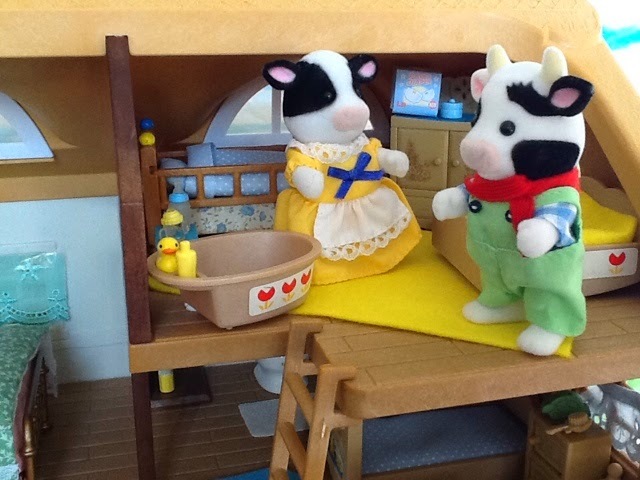 Hornbull obediently followed Daisy upstairs and further up to the attic room. Daisy: Look at this Hornbull, this is suppose to be a nursery. Does it look like a nursery? No it looks like someone with no feelings for their babies decorated this place. 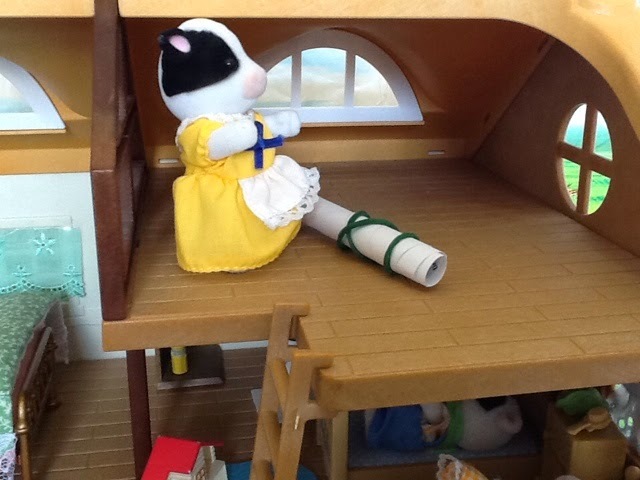 But Daisy was already back on the second level. Daisy: Look Hornbull! No carpets, no wallpaper, barley any curtains. We need to decorate! I don't want the most expensive mohair or whatever kind of carpets, I just want nice looking wall to wall carpets, matching curtains and some frames with family photos. 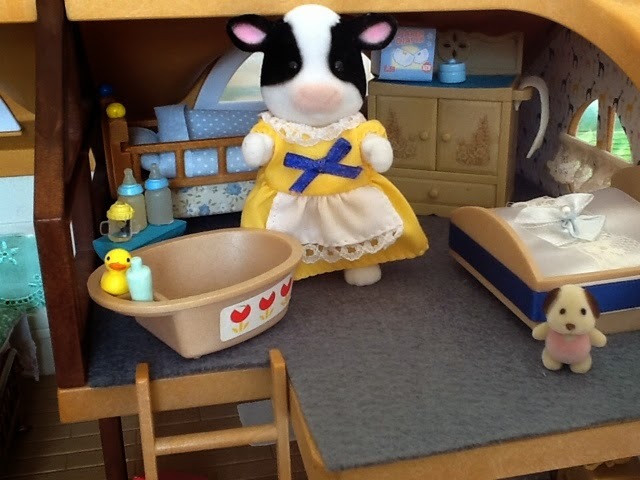 Daisy began to walk down the stairs to the kitchen again. Why is it so hard to convince men of the simple and basic needs in life. She was just about to give up on ever trying to convince Hornbull, when he called her into the loving room. Hornbull: Daisy, I'm sorry for not always understanding what you want, but if you want to redecorate the house, feel free to go ahead. I trust your decorating abilities and know our house will look even better than before. Daisy: Wonderful, wonderful. You are going to town tomorrow? Hornbull rolled his eyes at himself, he had to know that Daisy will not wait with this. And there was no stoping Daisy. 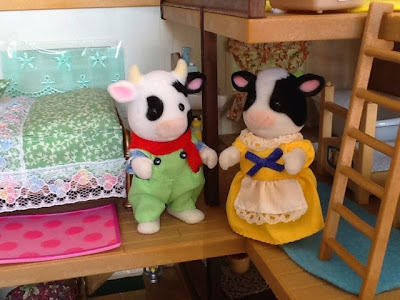 The next morning she went with Hornbull into the village and headed straight for the Haberdashery of the Thistlethorns. 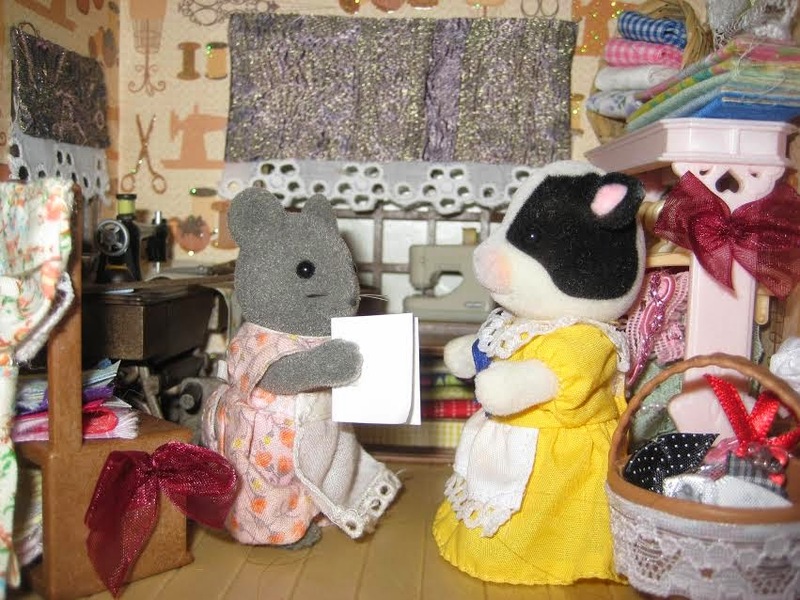 Although they specialised in materials, she hoped that maybe Willow will have some kind of catalogue with wallpaper in it. Willow obliged and even gave Daisy some guidelines of what kind of wallpaper to use where. 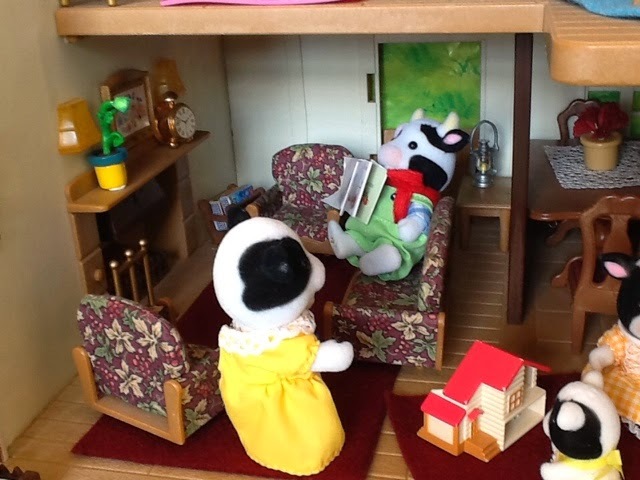 That evening at home she showed Hornbull her choices and he absentmindedly looked at it and agreed that her choices were fantastic. Sooner than expected the wallpaper arrived and Daisy could start her first project: The Nursery. She was extremely excited. Hornbull had to move all the furniture before he went into the village to drop the kids at school. Though he had to get up even earlier, he knew better than to complain. 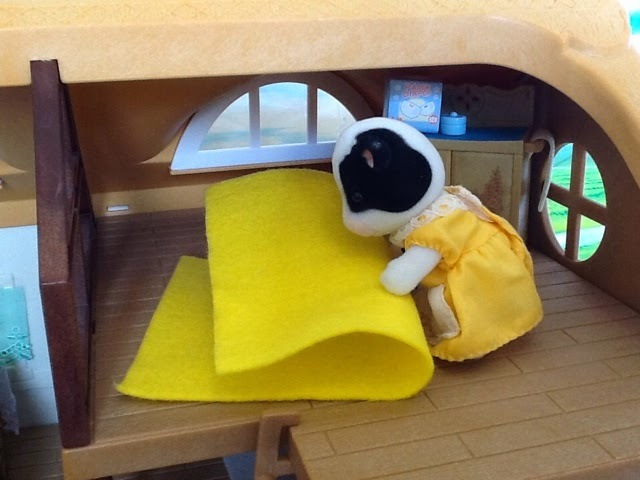 In between moving the furniture, Daisy rolled up the old yellow carpet, she will definitely get rid of it. She is really tired of it! Finally the attic was empty and Daisy could get started. She was terribly excited! Daisy worked extremely hard the entire day. She wanted to finish before her family arrived home. Finally, after putting the linen on the beds, she was happy. It looked modern, but cute. 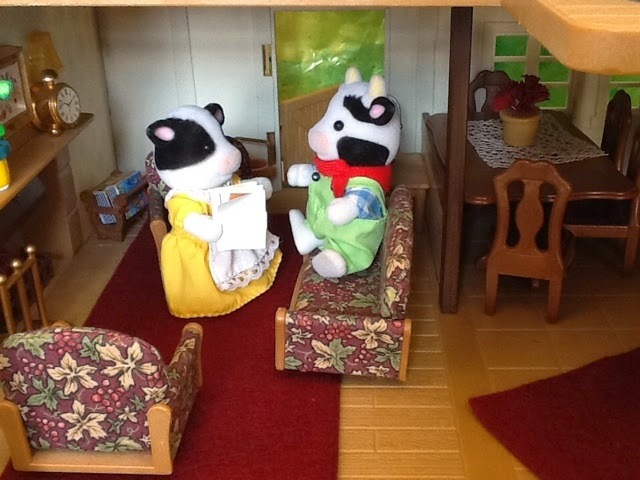 She loved the giraffe wallpaper and the grey carpet was much more practical than the old yellow rug. All that is missing now is the babies and their toys. 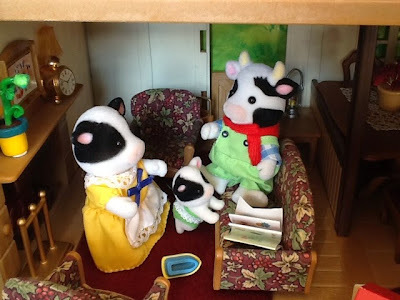 By the look of it the babies loved their new room and even Annabell who was always very critical, liked it. Thx S, yes he is! Hornbull is a softie all bark and no bite. A few ladies will pop in soon. Aww, Hornbull is such a cute husband :). Love his reaction on Daisys decorating idea. Typical :D.
Beautiful photos (Daisy looks so cute, rolling the rug). 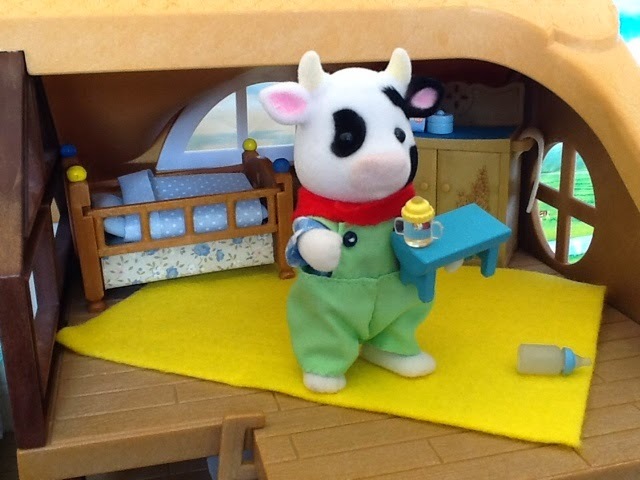 The nursery room is so charming- I'm sure the little cows will love it! 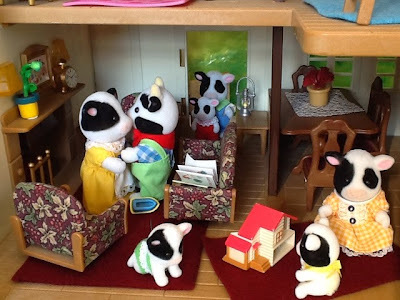 I'm lookig forward to see Daisys other ideas on decorating the house :). Thx for checking in Jennifer. I appreciate you comments! What a gorgeous story! All of your buildings look amazing, and are decorated soooo well. I'm sure Highfields Farm will be perfect in no time. 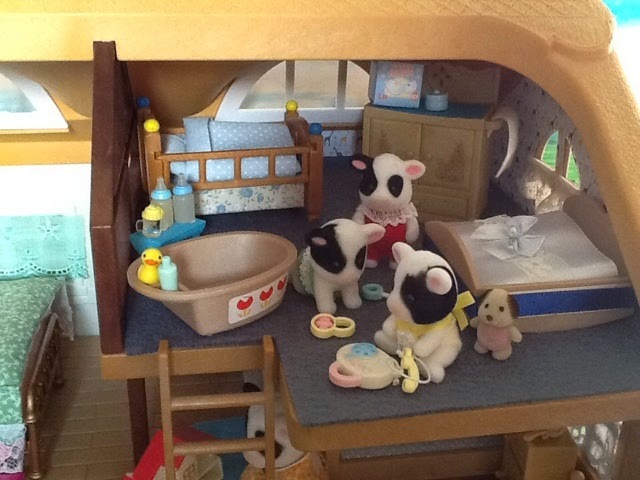 The new nursery is cuter than cute. Definitely an improvement! Thx Mia. I just love this house, can't wait to do the next room. This story is just wonderful - beautiful decorating and it gave me inspiration for my Rose Cottage :) I love the cow twins - and Hornbull, he is funny. Good luck with the rest of the house - I'm looking forward to see the next instalment! What a delightful story! 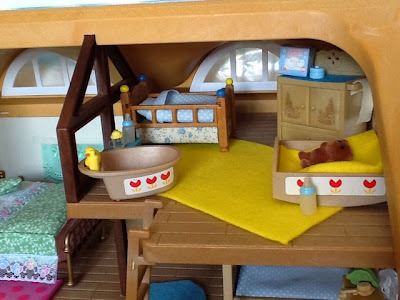 I really like the idea :) I love the vintage furniture in the nursery, it goes so well with the wallpaper and carpet. Thx Lily, I redid the nursery, wasnt happy, so be sure to watch out for the new story! Congratulations on getting the farm house! You did such a good job on the decoration and making it you very own home. That's what I like about your houses. You add so many little details and it becomes a really cozy home. Thank you so much Jane for the kind comment, be sure to keep an eye open for the next installment which is due soon! Interesting story especially that Hornbull's response was so real (cute) when hearing Daisy wanted to redecorating the house. Great job. Looking forward to next episode. Thank you. Hornbull is one of my favorite characters!